NYC Music Services has benefited greatly from the open-source music software community over the years. We've even had a hand in updating existing resources and creating new ones. We require that you provide your name and e-mail address when downloading our resources. The files will be delivered to you via a link contained in an e-mail; we will automatically notify you of any updates or changes. Your e-mail address will not be shared with anyone. If you are downloading multiple items, you can add them all to your cart before submitting your order. Just click on each item that you would like, and it will be added. These resources are offered as-is, and no support is available. They are free to download and use, but you have the option to pay what you wish — just name your own price before clicking the download link. We appreciate your support to continue their development! If you like these resources and use them in your work, please donate to support their continued development. Most people who use them donate a modest amount. Thank you! Enter your e-mail address to find your order history, re-download a product, and to download an update to a product you've already downloaded. Pay what you wish, and support development! Trying to decide how much to pay? The Norfolk suite includes 16 high-quality fonts plus a house style that makes them easy to use, so a suggested $20 would average out to about $1 per item. By comparison, custom music fonts for Sibelius are rare and cost $80 or more. Anything is appreciated — thank you! The Norfolk family of fonts is a derivative of Bravura that is expressly reconfigured to work within Sibelius. Bravura is the first SMuFL-compliant music font family, designed by Daniel Spreadbury at Steinberg for Dorico, its scoring application. Steinberg describes Bravura as drawing upon the heritage of the finest European music engraving of the 19th and early 20th centuries, with a bolder and more substantial look than most other music fonts: thin strokes are slightly thicker than in other fonts, improving the overall “blackness” of the font and its legibility when read at a distance. Figurato, a figured bass font designed by Florian Kretlow. Included along with these fonts is a house style designed to take maximum advantage of Norfolk’s characteristics. The house style is otherwise similar to Standard Opus (Times), but uses the Academico font as its main text font. You do not need the house style, Academico, or Gothic A1 to use the Norfolk fonts. Also included is a Sibelius document intended to help transfer Norfolk Harp Std characters into an existing Sibelius document. Please read the documentation included with the download for instructions. Norfolk Chords and Chords Sans ASC/ASL Std make use of some experimental features that are not yet fully supported in Sibelius. The Norfolk Chords and Chords Sans ASC/ASL Std fonts will only work in Sibelius 2018.11 and higher. For practical reasons, it was not possible to faithfully reproduce every symbol in Norfolk. Many of Sibelius’s symbols are actually composite symbols with intricate and tightly integrated positioning. Norfolk is, after all, a third-party font, and while we have tried our best to make it work as completely as possible, it is not as fully supported as the fonts that ship with Sibelius. If you have suggestions on how Norfolk can be improved, please contact us. Norfolk derives its name from Norfolk, Connecticut, home of the Norfolk Music Festival, where Jean Sibelius conducted the premiere of his work The Oceanides during his only visit to the United States in 1914. Matthew Maslanka of Maslanka Music Prep did all the heavy lifting porting Bravura to Norfolk, and creating the Norfolk house style. Jeff Kellem of Slanted Hall Type Foundry created the Norfolk chord symbol fonts and was greatly influential in continuing to develop the Norfolk project. Robin Walker is responsible for updating Norfolk Text Std with ligated dynamics and greatly contributed to the overall development of all of the fonts. Bob Zawalich and Robin Walker developed the Norfolk Harp Std font and created the transfer document. Bernie Cossentino of Twin Page Productions invented the concept of the angled slash chord font, created the Norfolk Chords ASC/ASL Std fonts based on the Norfolk Chords Std font, and greatly contributed to the overall development of the chord symbol fonts. Bravura and Academico were designed by Daniel Spreadbury of Steinberg Media Technologies. Figurato was designed by Florian Kretlow. Gothic A1 was designed by HanYang I&C Co.
Special thanks to Sam Butler of Avid Technology, Inc., for permission to use to the Opus font structure in the course of creating Norfolk. The Norfolk font family is made available under the SIL Open Font License, which means that the fonts are free to download, use, embed, redistribute with other software (including commercial software) or to create derivative versions. The only restrictions on its use are that they cannot be sold on their own, any derivative versions cannot use the reserved font names “Norfolk,” “Bravura”, “Academico,” or “Gothic A1”, and any derivative versions must likewise also be licensed under the SIL Open Font License. For more information about the SIL Open Font License, read the answers to these Frequently Asked Questions. If you make any improvements or additions to the Norfolk family, you are invited to submit those improvements to NYC Music Services for consideration for inclusion in the fonts. Please consider allowing others in the community to benefit from any improvements you make by allowing NYC Music Services to improve the core fonts, rather than choosing to create a derivative font. Trying to decide how much to pay? The Pori suite includes 14 high-quality fonts plus a house style that makes them easy to use, so a suggested $20 would average out to about $1 per item. By comparison, custom music fonts for Sibelius are rare and cost $80 or more. Anything is appreciated — thank you! 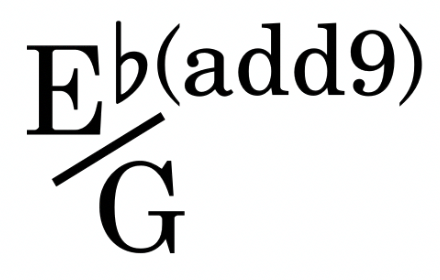 The Pori family of fonts is a derivative of Petaluma that is expressly reconfigured to work within Sibelius. Petaluma is a SMuFL-compliant music font family, designed by Anthony Hughes at Steinberg for Dorico, its scoring application. Steinberg describes Petaluma as a font family with a handwritten appearance, in the style of the hand copyists for Sher Publishing’s Real Book series, Ernie Mansfield and Ann Krinitsky. Included with the Pori fonts is the Petaluma Script text font, designed by Daniel Spreadbury at Steinberg for Dorico and intended to pair well with Pori. Included along with these fonts is a house style designed to take maximum advantage of Pori’s characteristics. It uses the Petaluma Script font as its main text font. You do not need the house style to use the Pori fonts. Pori Chords ASC/ASL Std make use of some experimental features that are not yet fully supported in Sibelius. The Pori Chords ASC/ASL Std fonts will only work in Sibelius 2018.11 and higher. Please read the documentation for other limitations. For practical reasons, it was not possible to faithfully reproduce every symbol in Pori. 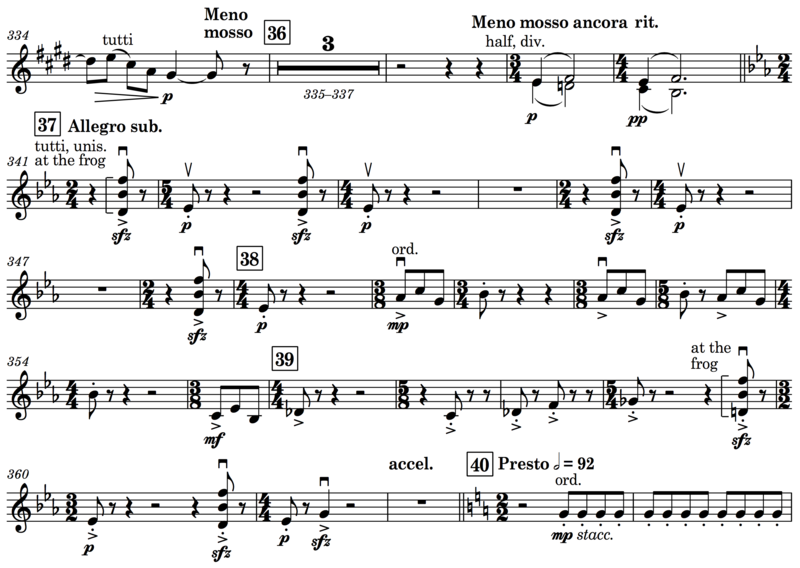 Many of Sibelius’s symbols are actually composite symbols with intricate and tightly integrated positioning. Pori is, after all, a third-party font, and while we have tried our best to make it work as completely as possible, it is not as fully supported as the fonts that ship with Sibelius. If you have suggestions on how Pori can be improved, please contact us. Pori derives its name from the coastal city in Finland which is home of Pori Jazz, a large international jazz festival held annually in July. Alex Freeman suggested the name. Jeff Kellem of Slanted Hall Type Foundry created the Pori fonts, did all the heavy lifting porting Petaluma to Pori, contributed to the Pori house style, and was greatly influential in continuing to develop the Pori project. Bernie Cossentino of Twin Page Productions invented the concept of the angled slash chord font, created the Pori Chords ASC Std font based on the Pori Chords Std font, and greatly contributed to the overall development of the chord symbol fonts. Bob Zawalich and Robin Walker assisted with testing and feedback of the Pori fonts. Petaluma was designed by Anthony Hughes of Steinberg Media Technologies. Petaluma Script was designed by Daniel Spreadbury of Steinberg Media Technologies. Special thanks to Sam Butler of Avid Technology, Inc., for permission to use to the Opus font structure in the course of creating Pori. The Pori font family is made available under the SIL Open Font License, which means that the fonts are free to download, use, embed, redistribute with other software (including commercial software) or to create derivative versions. The only restrictions on its use are that they cannot be sold on their own, any derivative versions cannot use the reserved font name “Pori” or “Petaluma”, and any derivative versions must likewise also be licensed under the SIL Open Font License. For more information about the SIL Open Font License, read the answers to these Frequently Asked Questions. If you make any improvements or additions to the Pori family, you are invited to submit those improvements to NYC Music Services for consideration for inclusion in the fonts. Please consider allowing others in the community to benefit from any improvements you make by allowing NYC Music Services to improve the core fonts, rather than choosing to create a derivative font. PDF-BatchScale quickly scales many PDF files to any size PDF. 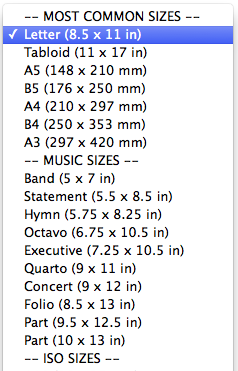 Originally intended to scale sheet music of different sizes, PDF-BatchScale should work on most PDFs, for any purpose. It’s the quickest way to resize many PDFs with one click! PDF-BatchScale PDF scales the original PDF to the specified size of the output PDF by the largest percentage possible while still fitting within the dimensions of the output PDF. The aspect ratio of the original PDF doesn’t change, so if the output page size is different than the original PDF, Batch Scale PDF will automatically add margins to the output PDF as needed. Simply drag and drop your files onto the application window, or click the Add button to locate them in your file browser. Choose from many standard page sizes, such as ISO, North American or music sizes, or input your own custom size. You can also change page orientation, add margins, add a prefix or suffix to the filename of the newly-generated PDF file. Specify a new output directory or use the source directory. PDF-BatchScale was developed by Abraham Lee with input from Philip Rothman. Donations accepted by writing to Abraham Lee. PDF-BatchScale is free software; you can redistribute it and/or modify it under the terms of the GNU General Public License as published by the Free Software Foundation; either version 2 of the License, or (at your option) any later version. PDF-BatchBooklet quickly creates booklets from many PDF files. Originally intended to make booklets for sheet music, PDF-BatchBooklet should work on most PDFs, for any purpose. It’s the quickest way to make booklets from PDFs with one click! PDF-BatchBooklet creates booklets by imposing the pages for printing. The original image size is retained. For instance, it will take letter-size pages (8.5”x11”) and impose them on 17”x11” paper. It can impose the pages to make a traditional booklet to be printed double-sided, or it can also make an accordion-style booklet to be printed on single-sided paper. An option to allow half-sheets is also available. Choose Folded Booklet Order to create a traditional booklet for double-sided printing. Choose Allow half sheets to create a double-sided insert on the same size page as the original PDF. Choose Straight Page Order to create an accordion-style book for single-sided printing. Choose Allow half sheets for the last page in an odd-numbered PDF to be created on the same size page as the original PDF. Optionally add a prefix or suffix to the filename of the newly-generated PDF file. PDF-BatchBooklet was developed by Abraham Lee with input from Philip Rothman. Donations accepted by writing to Abraham Lee. PDF-BatchBooklet is free software; you can redistribute it and/or modify it under the terms of the GNU General Public License as published by the Free Software Foundation; either version 2 of the License, or (at your option) any later version. Registration via e-mail is required to download the app from this page. The app will be delivered to you via a link contained in the e-mail. This way, we can automatically notify you of updates to the app. Your e-mail address will not be shared with anyone else. 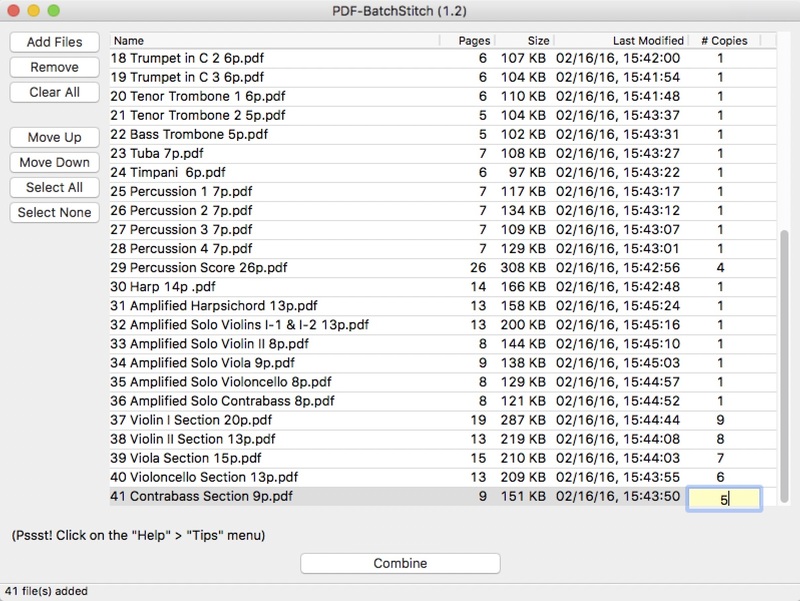 PDF-BatchStitch is the free and fast utility that combines multiple PDFs into one file, along with the option to set the number of copies for any of the PDFs. 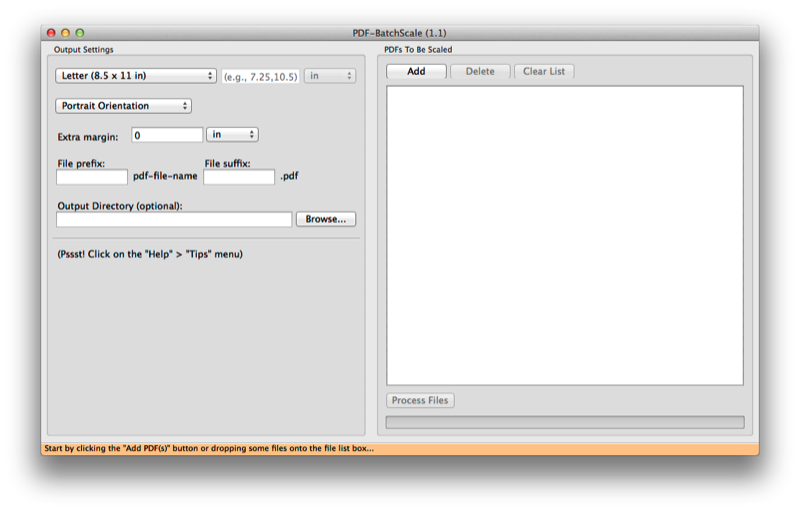 PDF-BatchStitch quickly combines many PDF files into one PDF. Simply drag and drop your files onto the application window, or click the Add Files button to locate them in your file browser. Set the number of copies per part, and re-order by using the Move Up and Move Down buttons. Click Combine to save the file. A window will appear prompting you for the file name and location. 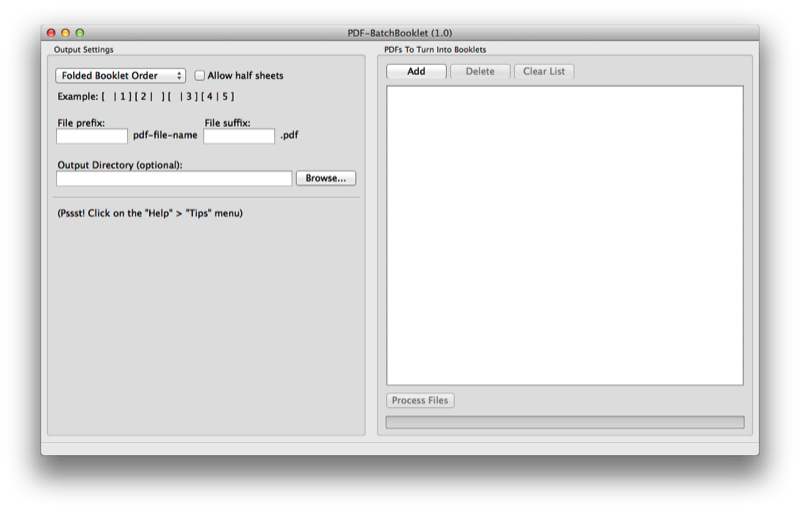 PDF-BatchStitch was developed by Abraham Lee with input from Philip Rothman. Donations accepted by writing to Abraham Lee. 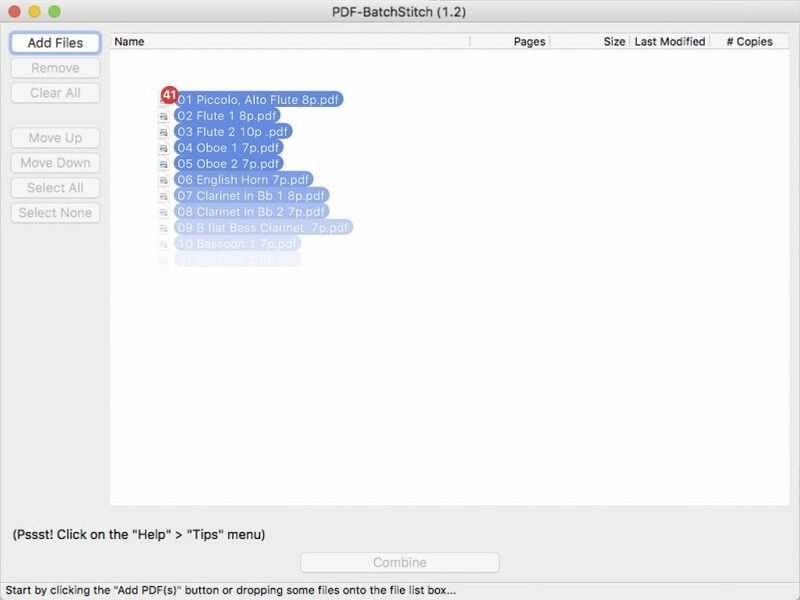 PDF-BatchStitch is free software; you can redistribute it and/or modify it under the terms of the GNU General Public License as published by the Free Software Foundation; either version 2 of the License, or (at your option) any later version. PDF-MusicBinder is a fast way to create consolidated PDFs for easy printing for either accordion-style layout or stapled imposed booklets. 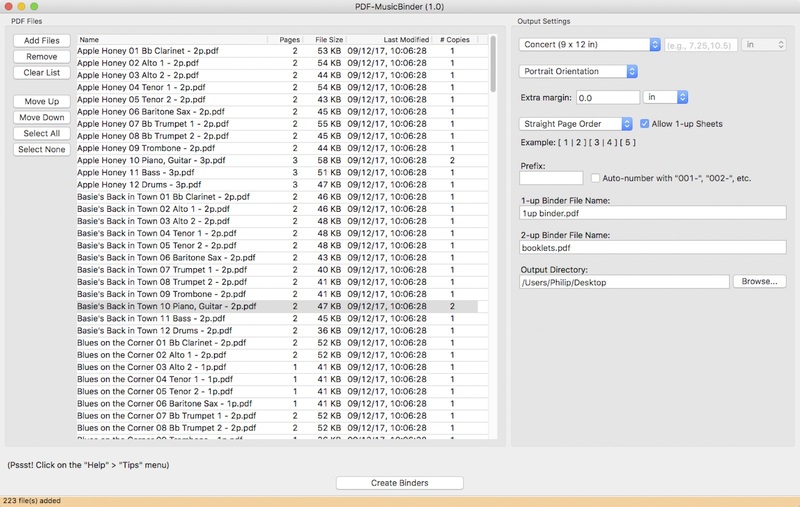 PDF-MusicBinder takes single-sided PDFs that are generally outputted from notation software, and rearranges them into PDFs that can be printed on larger size paper and then folded. It can even resize the PDF in one step. You can also change page orientation and add margins. Choose Allow 1-up Sheets to create a double-sided insert on the same size page as the original PDF. Choose Allow 1-up Sheets for the last page in an odd-numbered PDF to be created on the same size page as the original PDF. Optionally add a prefix or suffix to the filename of the newly-generated PDF file(s). Specify a new output directory or use the source directory. PDF-MusicBinder will create a complete binder of 2-up files (and 1-up files, if necessary) that will be print-ready. 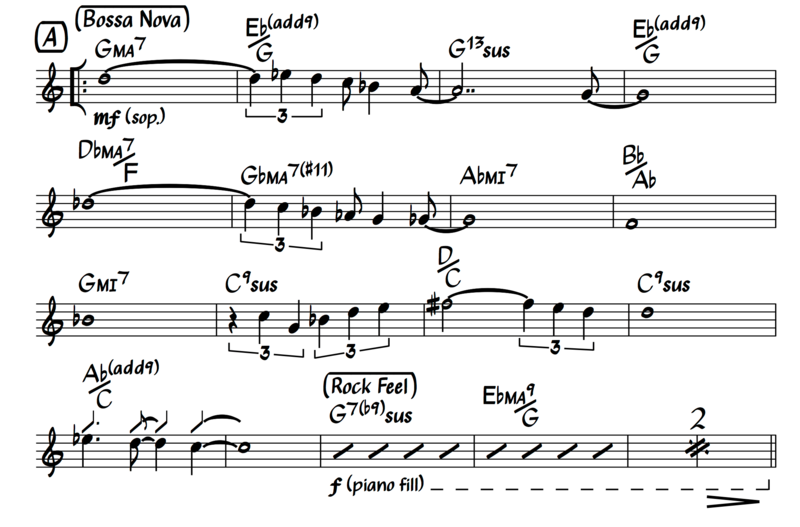 PDF-MusicBinder was developed by Abraham Lee with input from Philip Rothman and Robert Puff. Donations accepted by writing to Abraham Lee. PDF-MusicBinder is free software; you can redistribute it and/or modify it under the terms of the GNU General Public License as published by the Free Software Foundation; either version 2 of the License, or (at your option) any later version. This is a list of downloadable Sibelius plug-ins, usually written by Sibelius users. These plug-ins are free, but are available on an “as is” basis, and Avid does not provide support for them. It is your responsibility to determine whether the plug-ins are suitable for your needs and use is at your own risk. The links direct you to the files stored on Sibelius plug-in download page, where more information is available. They can be viewed alphabetically by name, or sorted by other fields. This list was originally built by Bob Zawalich and is now maintained by NYC Music Services. There are currently 422 plugins written by Bob on the download page. For instructions on installing these plug-ins in Sibelius versions prior to 7, see the Sibelius plug-ins download page. In Sibelius 7 and later, you can install plug-ins with File > Plug-ins > Install Plug-ins. You will need to know the category of the plug-in to find it for installation. Generally, if a plug-in is labeled as compatible with Sibelius 8, it is also compatible with Sibelius Ultimate 2018.x and later. Last updated on April 22, 2019. There are 554 plug-ins on the page. Due to some deletions, the highest plug-in id is 586. Batch Transpose 12 Keys Bob Zawalich Batch Processing "6 - 8""
New and updated plug-ins for Sibelius.